If you’re not on the west coast, you can substitute grouse for the chukar. I love these little birds! They are the perfect size for a main course, and while they aren't too strong on flavor, they make for a nice game bird for the timid eater. It's early spring and rhubarb is in season, and so I glazed it with some rhubarb syrup. I decided to serve it with a side of sautéed cannellini beans and artichoke barigoule. It kept the dish light, and highlighted the idea that, "things that grow together, go together." If you're not on the west coast, you can substitute grouse for the chukar. Heat the water until boiling and add all the remaining brine ingredients and stir until the salt and sugar are dissolved. Set the liquid aside until it's completely cooled. Line a large bowl with a turkey roasting bag and add the chukar. Pour the cooled brine into the bag with the chukar and tie tightly closed. Place the birds in the fridge for 24 hours. Add the beans to a large pot and pour in enough water to come up two inches above the beans. Peel the shallot and stick the whole cloves directly into the shallot. Add the remaining ingredients and bring the beans to a light simmer. Simmer beans for about 1 hour. Check the beans for doneness, and add additional time if needed. Once the beans are done, drain, remove and discard the shallot, carrot and bay leaf, and season the beans with salt and pepper. Refrigerate for the next day, if desired. **Never salt beans until they are finished cooking, because salt will make the skins tough. Cut rhubarb into 2 inch pieces and set in a medium sized pot. Add all the other ingredients and simmer for about 20 minutes, or until the rhubarb is tender. Place a mesh strainer over a bowl and pour the cooked rhubarb into the strainer, so the syrup drips down through the strainer and into the bowl. *The cooked rhubarb can be discarded or used as a topping for ice cream. Reserve the syrup for the glaze. Remove the top 1 inch of the artichokes, peel the outer green leaves and discard. Peel the stems lightly to remove a bit of the outer layer, but leave mostly in tact. Scoop out the fuzzy purple choke in the center and discard. Once the artichoke is cleaned, cut the artichoke in half and quickly add the artichoke to the lemon water to keep it from browning. Cut the carrots, celery and shallots and garlic and set aside. Heat a pan over medium heat and add 3 tablespoons of butter or oil and the cut up vegetables. Drain the artichokes and add to the pan. Saute for 2 minutes, then add all the remaining liquids, herbs and spices. Bring to a simmer and cook for 20 minutes. Once the artichokes are tender, add the cannelloni beans and heat through. Refrigerate the day ahead, and reheat over medium heat while the chukar are roasting. Mix the butter, garlic powder, fresh thyme leaves, marjoram and salt and pepper to make a compound butter. Loosen the skin of the chukar under the breast and divide the compound butter in 2 and gently push the butter under the skin on each side. Season inside and outside the chukar with salt and pepper. Heat a large oven safe sauté pan with canola oil, or duck fat. Sear the chukar on all sides and place the pan in the oven and roast for 20 minutes, total. Basting every five minutes with the rhubarb syrup. Once the chukar are roasted, remove them and baste once more, while the side dishes are being re-heated. If the Cannellini beans and artichoke barigoule were done the day ahead, heat a large sauté pan with a few tablespoons oil and add the beans and artichoke barigoule and heat through. Heat a large sauté pan over medium-high heat and add the mushrooms and sauté 2 minutes. 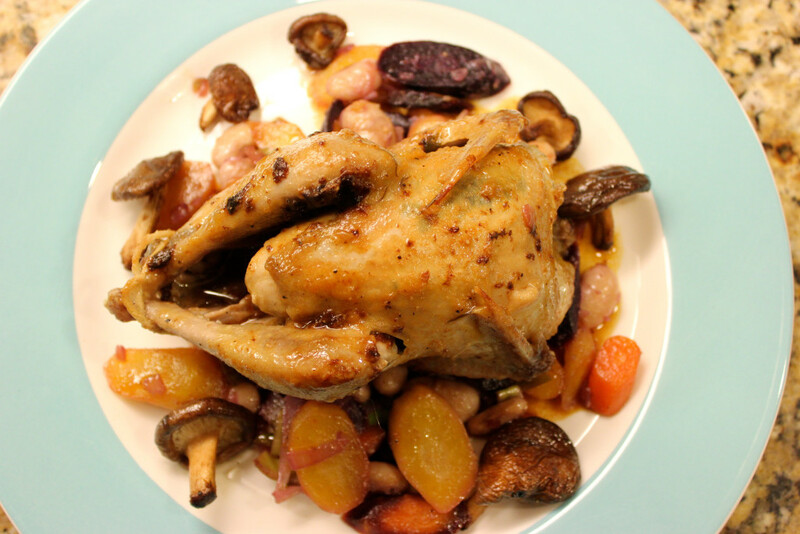 Serve with roasted chukar, cannelloni beans and artichoke barigoule. **Substitute a jar of orange marmalade, warmed through for rhubarb syrup. ***A can of drained artichoke hearts can be substituted for the fresh artichokes, but reduce the amount of wine and stock by half, and sauté and cook the vegetables ONLY, for 20 minutes and add the artichokes and cannellini beans, once the vegetables are softened just till warmed through. To save time, the brine, cannelloni beans, artichoke barigoule, rhubarb syrup and compound butter can all be done the day ahead, and simply re-heated. The roasting and sautéing mushrooms should be done last minute.